The U.S. and the U.K. should negotiate a free trade area based on the principles of national sovereignty and economic freedom. For both nations, the barrier to this goal is the European Union. Britain cannot negotiate unless it leaves the EU, while the U.S. has wrongly supported the EU over the sovereignty of its member nations. The U.S. policy of using Britain as its Trojan Horse in the EU is wrong in principle and doomed to failure in practice. The U.K. must ensure that its referendum on EU membership offers a real choice. There is no reason why the U.K., the world’s sixth-largest economy, cannot negotiate trade arrangements outside the EU. For those interested, the full text is here and I found it exciting and stimulating. Onwards and upwards! For those interested, the full text is at http://www.heritage.org/ and I found it exciting and stimulating. Onwards and upwards! How long will this take, how many people go bust in the meantime and will I still be alive when it's all settled? Are you serious? This is far worse than 2008. The fall in the world's stockmarkets on Friday was $2,000,000,000,000 . As i just said to Wes, you have no idea of the damage that you have caused. The negotiations on the TTIP between the EU and the US were started in 2013 and are not expected to be complete until 2020. The French will make sure they are never completed. And if they are completed before us? Correct, Valls said only yesterday that there wouldn't be a TTIP, said it was undesirable and impossible. Mind you with elections in 10 months time who knows. Wanted: Trade negotiators, no experience necessary. Average intelligence desirable. Apply to: Absolutely Clueless, BoJo House. Pay: Tons of Zimbabwe dollars. Says the man who doesnt know the difference between derivatives and debt and thinks Deutsche owes 50 times the GDP of Germany and will wipe out Europe. It's not fear of the unknown, it's fear of a certainty. The pound has plummeted against the dollar and so has the Euro, to some extent, so imports are much more expensive but selling prices have not gone down. In any case, the 20% drop in 2008 (from $1.86!) did nothing to improve exports so there's no guarantee that this fall will be of any help. Please explain to me how a weak £ enhances the value of UK stocks? Once the Brexit lot has published their plan, everything will be sunshine and light. They do have a plan, don't they? Surely they wouldn't embark on such a momentous change without first drawing up a detailed programme of how do deal with the hundreds of strategic issues that will need to be addressed? You're one of the few that isn't. That's been the problem all along. The Brexiteers were neither in a position to deliver what they promised nor take the consequences for it. What they wanted was for a narrow remain vote so that they could continue their world of blaming all the ills of Britain on the EU. Now their whole reason for being has evaporated and UKIP might as well disband. All their calls for a Brexit government are a bit hollow considering there is an overwhelming majority in Parliament for remaining in the EU, a Parliament that is only just over one year old. They are losing money and will need recapitalisation for sure, but its a couple of tens of billions not armeggedon. Banks are like a combination of bookie and insurance company now - covering business against unexpected movements in price / value. Most of their exposure is covered by other positions. Bookies write billions of pounds of business each years even though their capitalisation is a tiny fraction of that. The wins offset the losses and nobody seriously expects that they will have to pay out on every bet. And they are backed by governments. Just as Carney promised £250bn if needed. There's plenty to play with, they can always print some more. Must also be completely convinced mankind cannot affect the climate of the Earth. For those interested, the full text is at http://www.heritage.org and I found it exciting and stimulating. Onwards and upwards! Noises coming out of the US are showing that we aren't at the back of the queue by any stretch of the imagination..
"They've been a great trading partner to the United States for decades and decades, and I wouldn't stop trading with them 'cause they got out of the EU," Sen. Johnny Isakson (R-Ga.) said. "I'd be happy to negotiate a bilateral agreement." Bill Reinsch, former president of the National Foreign Trade Council who is now a fellow at the Stimson Center, is also bullish on opening negotiations with the U.K. while “reaffirming our commitment to the EU.” “President Obama may have put [the U.K.] in the back of the queue when it comes to negotiating a trade agreement, but he should put that aside and move quickly to work out a bilateral agreement that builds on our relationship," Reinsch said. ... assuming that the USA is not capable of negotiating more than one deal at a time. I am disappointed, as I thought someone of your academic standing would get this. Its true Johnny. The US have spare trade negotiators kept in a cupboard just in case a friend and ally suddenly finds themselves at a loose end. Its like burger flipping y'see, anyone can do it. Perhaps it is other countries that will be forced to the back of the queue... whilst we queue jump. Not a very British thing to do, but needs must. Last edited by Johnny Bognor; 28-06-2016 at 11:04 AM. The reality is that the US will push Britain to to what is in its (US) best interests, and that is to stay in the EU. They aren't going to be making it easy for us to leave. If leaving becomes a fait accompli their attitude may change, but I wouldnt bet my economy on it. I'd say that statement supports my position above, not yours. They want the TTIP and they want Britain in the EU batting for it. Whether we get priority in queue jumping depends on who wins the Presidential election. Clinton isnt going to bolster the UK conservative right epitomised by Boris and Farage against her more natural allies the conservative left. Trump might, but then he isnt going to win. Valls said yesterday that there will be no TTIP. He did. That doesn't mean there won't be. At the end of the day, the priority of negotiations isn't fixed. There is no orderly queue formed on a first come first served basis. In business, things change and you focus on the things that give you the most/best return. In value terms, I'm sure a deal with the EU would be preferable to the UK, especially if there was a strict choice between the two. But in the event of a quick deal with the UK, whilst EU negotiations continue, then that would happen. In addition, if there are negotiations on a trade deal with Swaziland and the UK comes along, do you not think that priorities might shift a bit? I guess you can't always correlate academic achievement with knowing how to win business and generate wealth. They arent in negotiations with Swaziland. We can do the **** waving about wealth creation if you like Johnny. Ultimately its a political decision. As no-one knows who the US President will be, who the UK PM will be or what the game plan will be, its a zero sum game. Johnneh, many of those remarks are just mom-and-apple pie statements about how the US wants a tradiing relationship with the UK. Who doesn't? Obama never said he didn't. Is that because the doors are shut and the 'Closed' sign is up ? We don't actually have any civil servants who can negotiate these deals. We haven't done that for 43 years. How is it a zero sum game? Last edited by Johnny Bognor; 28-06-2016 at 02:26 PM. These appear to be all Republicans making these comments, when it's looking increasingly likely that a Democrat will be the President. But the argument that Britain, as a non-EU member, would not be able to negotiate satisfactory trading arrangements has no substance. Certainly, there are many ways that Britain could leave the EU and many possible ways to govern the continuing U.K.–EU trade after Britain’s departure, but the example of the European Free Trade Association (EFTA) shows that concerns about Britain’s ability to negotiate once it leaves the EU are unfounded. EFTA, whose four members are non-EU states Iceland, Liechtenstein, Norway, and Switzerland, has negotiated many free trade agreements. While the EU’s record of concluding such agreements (outside Europe, it has 18 FTAs) is comparable to that of the U.S. (which has 20 FTAs), it is worse than that of EFTA, which has FTAs with 35 nations. The EU is very good at announcing the commencement of FTA negotiations but less good at concluding agreements. For example, to the frustration of many in the U.K., including Prime Minister David Cameron, the EU’s negotiations with India are “far from being concluded,” while negotiations between EFTA and India are proceeding. 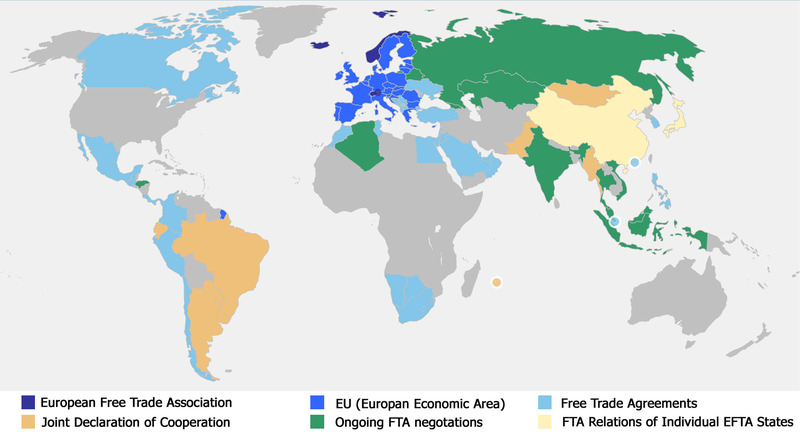 EFTA member states have signed FTA agreements with China. As Conservative member of the European Parliament Daniel Hannan recently noted, were it not an EU member, “Britain would have signed a bilateral free trade agreement with the United States decades ago.” Given the fact that the U.S. has free trade agreements with many nations that have much smaller economies than that of the U.K. and are considerably less vital economic partners and strategic allies, Hannan is certainly correct. Where does that say that we have the skills and experience to undertake these negotiations? In any case, a trade deal is nothing as straightforward as the Single Market. Sending to France (or any EU member) at the moment is a doddle, you just send it. Sending to anywhere in the rest of the world is a palaver and involves delays and costs. Having a trade deal doesn't mean that there will be any trade. Would these be the same EU people who will be stopped from entering Britain? Last edited by Johnny Bognor; 28-06-2016 at 02:31 PM. Its a bit more complicated pal. If you've followed the primaries closely (obviously you haven't), you'll have noted that there has been hardening on both sides against free trade. "Free trade will not have an ally in the White House next year"
Please don't try to lecture me on world trade. I have been selling stuff across the world for over 30 years. Nothing is as straightforward as the Single Market. Anything else costs more. Here's another one for you to read and the original one is here. Read and learn. You're never too old! PS: The UK have a very large number of lawyers and civil servants who will be out of a job, now that we have left the EU. Nothing is as straightforward as the Single Market. Anything else costs more.